Mexican antojitos are everywhere and such a cheap and easy way to try different Mexican food. Some days I eat so many of these popular Mexican snacks in Playa del Carmen that I’m too full for regular meals. But that’s ok because my goal is always to try a lot of different food and Mexican street food just may be one of my favourite in the world. Antojitos in English are translated to little cravings or whims. Some people say they are the equivalent of Spanish tapas because you have just have one, or you can order a few and it’s enough for a meal. They can be great vegetarian options or have meat, in fact the only common element of Mexican antojitos are that the dough is always made from corn. The biggest meal of the day is an afternoon lunch so you’ll find most antojitos in the morning or evening. People often grab them as food on the go. Because they are such small bites you can try several as a meal and decide which you like best. Although some of the names sound familiar, perhaps the same as what you’ve eaten at a Mexican restaurant at home, you need to keep an open mind. Quesadillas and burritos aren’t quite the same. So if your mind is a blank slate you can really decide which you like best. You can find these Mexican snacks for a very cheap price at food cart in Mexico. If you’d prefer to try antojitos in restaurants, it’s common to list appetizers as antojitos. They’ll cost a bit more but it’s a great introduction to these tasty treats. My favourite way to start the day. They can be baked but you’ll find them fried to order on the street. Empanadas are basically a turnover with your choice of filling. They are also known as pastels in Brazil, although they appear much larger. My favourite in Playa del Carmen is simply topped with cheese, lettuce, pickled onion, a tiny bit of hot sauce and cream – don’t skip the cream! It’s not sour cream it’s much better! You can find empanadas for about 10 pesos (50 cents USD). These are small so you may want more than one. I’ll admit I thought burritos were an American Tex Mex invention because I could not imagine such a mammoth dish coming out of Mexico. You won’t find a gargantuan wrap of rice, cheese and meat for a full meal afterall “ito” signifies small in Spanish – not something so much it would be a complete lunch. Authentic Mexican burritos are a snack, usually with meat, often with onion and poblano pepper or chile sauce. The ultimate beach snack, look for locals carrying what appears to be a fish tank on their head. These oval shaped snacks are made with wheat, ground meat or fish and topped with pickled red onion and cabbage. They may remind you of a falafel, which isn’t surprising as they were brought to the region by Lebanese immigrants and are now a local favourite – especially as an after school snack. Served as breakfast and infamous as the perfect hangover cure. Fried tortillas are topped with a red or green sauce, chicken and queso fresco. I have to admit they are not my favourite as I find the tortilla chips get soggy really fast. However, the truth is I only tried them once in 2010 while exploring Tulum restaurants. So I should really give them another shot because so many people adore this Mexican antojito. Rolled corn tortillas filled with meat, and/or beans, vegetables and cheese and topped with a chile sauce. In fact, enchilada literally means to dress with chile. The ingredients vary depending where you are in Mexic. In Oaxaca enchiladas are served in a mole sauce. 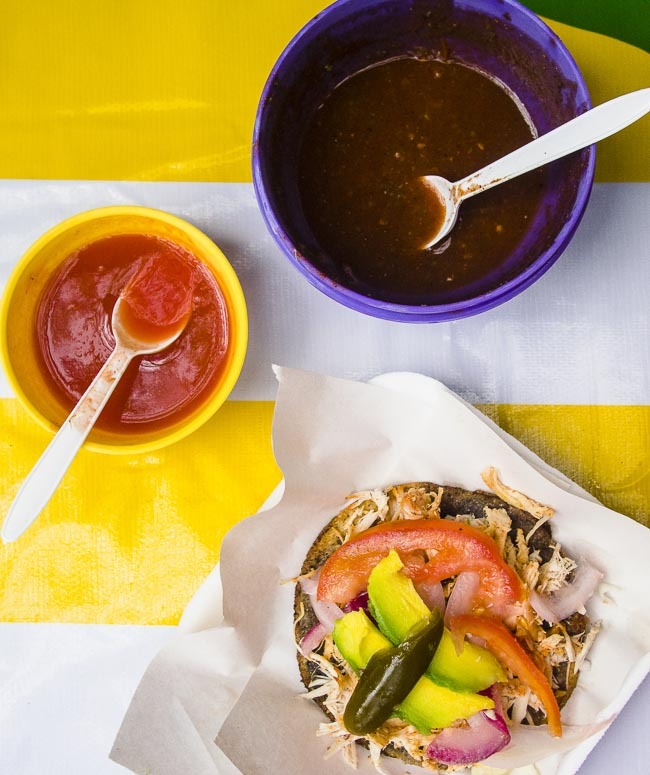 A specialty from the Yucatan you can find panuchos at any antojito cart in Playa del Carmen. Fried puffed tortillas are stuffed with fried beans and topped with cabbage, pickled onion and often your choice of shredded meat – I prefer chicken and a touch of lime juice. Also a tradition food of the Yucatan peninsula, salbutes are similar to panuchos but a bit different. Corn tortillas are fried then topped with shredded meat and vegetables. You will not find fried beans here. 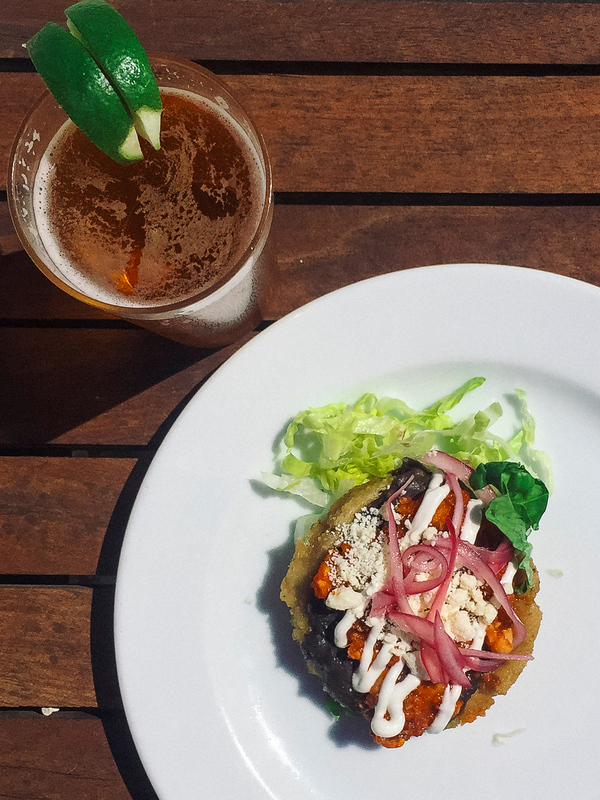 Without being too confusing tostadas are also similar to panuchos and salbutes. Tostadas are fried but they are not puffed tortillas. They are not one of my favourite things to eat as I find once you take a bite it can begin to crumble and make a mess. These are best to eat in a restaurant where you can scoop up the fallen toppings with a spoon, check out some of my favourite Playa del Carmen restaurants. Sometimes these are referred to as Yucatecan enchiladas but they may predate enchiladas. Papadzules is a Mayan dish where tortillas are dipped in a pumpkin seed sauce, rolled with hard boiled eggs and topped with a tomato chile sauce. Tourists looking for something familiar will be disappointed by quesadillas. Yes they are tortillas folded and stuffed with cheese and some kind of filling but don’t expect the stretchy cheddar or mozzarella kind of cheese from home. In Playa del Carmen it is a fresh cheese; however, this is a great vegetarian food option in Playa del Carmen where it may be stuffed with zucchini blossoms or decadent huitlacoche. Many Mexico antojitos have different regional names. Gorditas in Playa del Carmen are called sopes and in other regions called pellizcadas. Sopes are made with corn tortilla dough but instead of a tortilla they are formed into patties the size of your hand and cooked on a flat top or fried. These corn cakes can be topped with any ingredients but if you’re lucky they will have pinched sides to keep the food from falling. Another great breakfast option. 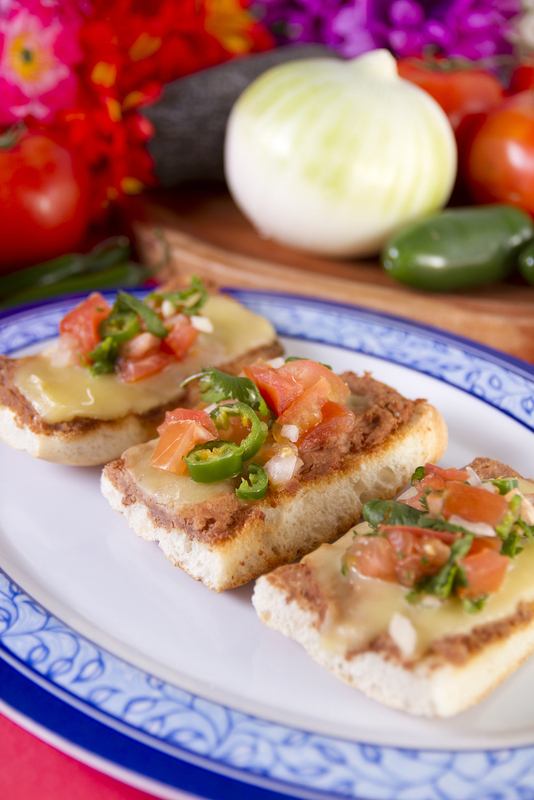 Slices of bread topped and baked with refried beans and cheese and topped with pico de gallo, which is a simple tomato salsa. I prefer a light breakfast in Mexico so these are perfect for me. But if you need a bit more sustenance a bit of scrambled eggs make it a full meal. The most filling of the Mexican antojitos, I think tortas are one of the top ten sandwiches in the world. While every region in Mexico does them differently, one of the most delicious tortas is in the Yucatan. It’s common to find them filled with cochinita pibil, which is a shredded pork, these will keep you full for hours. Masa, or tortilla dough is steamed for hours in a corn husk or banana leaf with a topping and sauce. Beginner tip – Don’t eat the wrapping! They were once very plain but when the Spanish arrived in Mexico they incorporated pork and other ingredients that are now common. Made throughout Mexico, tamales can be savoury or sweet with many different toppings or sauces. A local street food served into early hours, look for women with big covered pots outside supermarkets, plazas or banks. They can also be a great vegetarian option in Playa del Carmen. There are many different kinds of tamales in Mexico. If you’re looking for the most traditional tamale in the Yucatan look for tamal torteado de pollo with chicken and red sauce. 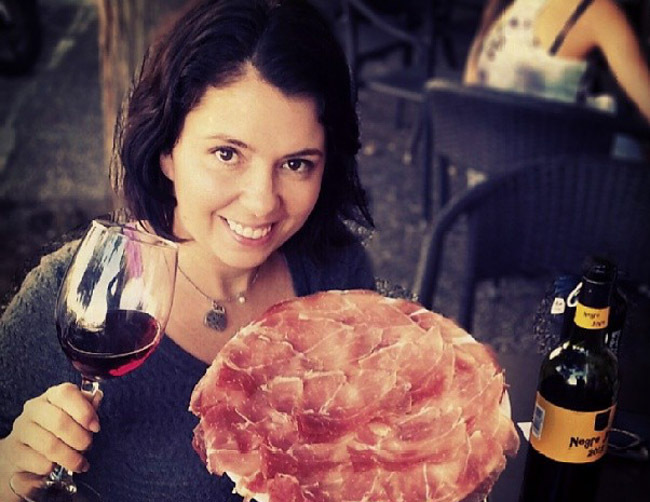 Dona Mary on Avenida 30 is a great place to try it. No Mexican antojitos list would be complete without street tacos. In Playa del Carmen you’ll find the largest concentration of street taco stands just down the road from the ADO bus station at Benito Juarez and 15th Avenue with many others in the surrounding area. There are often two or three sauces available so be sure to ask which is the most spicy or picante because the green salsa is often habanero and can be quite spicy. Absolutely one of my favourite things to eat in Oaxaca, tlayudas are crispy tortillas filled with pork lard, meat, refried beans and cabbage. My favourite place, Tlayudas Libres opened in the street at 11pm each night. On the street they are folded in half but in restaurants they look like a tortilla pizza. The most epic of the Mexican antojitos, I laughed with many street vendors in Playa del Carmen as I tried to get them to explain why it was called gringa. Gringas are basically double stuffed quesadillas. They are gigantic so I’m not sure why they are named after female foreigners. One told me that it was because the brown spots appear on the tortilla in the hear – much like the freckles of female tourists. This was my favourite story as I always have a freckled face from the Mexican sun. However, if Mexican antojitos are little cravings I think gringas should be disqualified as they are gigantic and not a snack but a super sized meal. This list of popular Mexican snacks focused on what I ate in Playa del Carmen. But if I’ve missed any that you have eaten elsewhere I’d love to hear about them. Leave a comment below and let me know what Mexican antojitos you’ve eaten and where I can find them. I’ll put them on my travel to-do list. I think this is the first time I can say that I’ve had some of the dishes in your post! My two week trip to Playa del Carmen was an amazing food adventure. Best tip you taught me was to “pinky finger dab” the sauce before I put it on and to pour from “high up”! I like it hot but even I have a limit.